I didn't really expect to be given this Arte Y Pico Award. I haven't heard of it before... it sounds so foreign really. Nor do I have any idea as to why this award was given to me in the first place. I mean... whatever did I do to deserve this? But anyway, it's the thought that counts so thanks to Pchi for deeming me worthy of this award. So now, I would like to pass this on to my newfound friends in the blogosphere. Please indulge me on this one as there are certain rules for passing this on. 1) Pick 5 blogs that you would like to award this honor to. 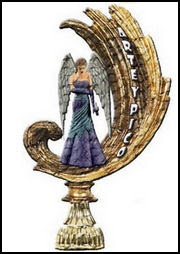 4) Award-winner and the one who has given the prize have to show the link of http://arteypico.blogspot.com/ so everyone will know the origin of this award. Awarding this to Sarah, Liza, Juliana, Wiehanne, Jerome for their creativity and expertise in their own arts. Visiting you from entrecard. youve got a lovely site.